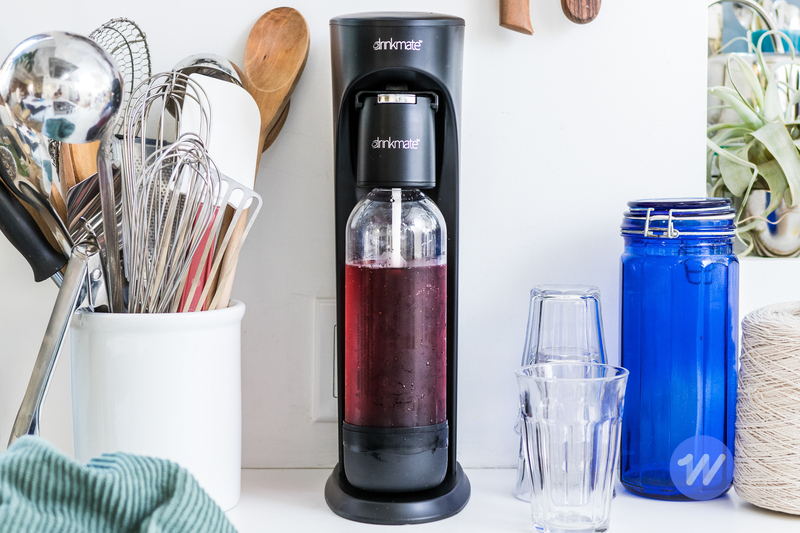 Yep, SodaStream makes the list -- twice. 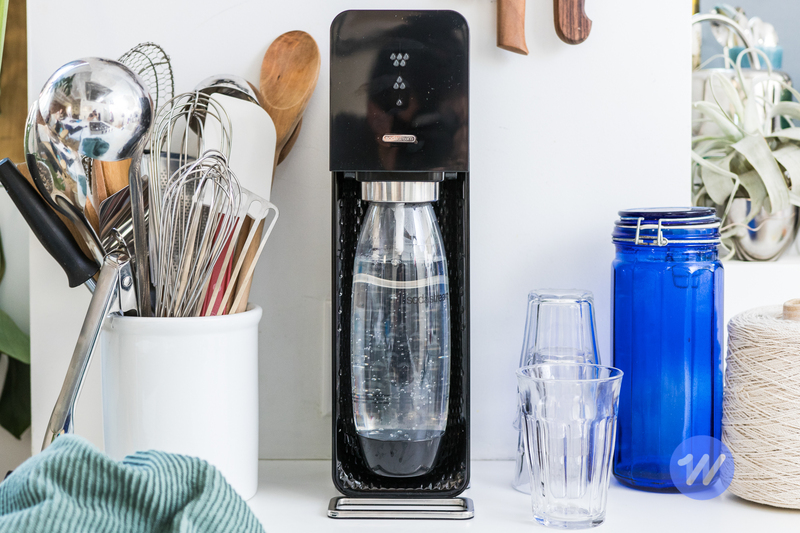 After more than 47 hours of research and 155 hours of testing, we're confident the SodaStream Source is the best home soda maker you can buy. Over the past three years we've tested 12 soda makers and siphons, made our own DIY version, and talked extensively with home soda-making experts and scientists about carbonation (as well as consumed many liters of seltzer!). The Source makes some of the bubbliest, best-tasting sparkling water, and it's easier to use than the competition. If you love sparkling water and are tired of lugging home bottles or cans, investing in a soda maker allows you to carbonate regular tap water easily. With a soda maker, you can carbonate about a liter of water at a time and experiment with your beverage choice at a moment's notice. These gadgets use recyclable or refillable cylinders of carbon dioxide instead of disposable plastic bottles, so you'll also have a slightly lower environmental impact. Soda makers work by injecting carbon dioxide into water to produce effervescence. The best soda makers add enough carbon dioxide to produce water with a Perrier-like fizz. Most models use a cylinder to inject the CO2, but over the years we've seen a few soda makers that use alternative methods such as sodium bicarbonate tablets, or pods filled with carbonator beads. We looked at soda maker offerings at prominent home-goods retailers, as well as Amazon's top-rated models. We decided to test two new models against our former picks from previous years. We set up each soda maker to observe how easy it was to assemble and use. We then carbonated water that we chilled to 39 degrees Fahrenheit, because to make the fizziest results, the water should be cold. We took into account how easy it was to control the fizz level, as well as the mouthfeel and flavor of the finished product. We also conducted a blind taste test with two soda experts, Chris Onstad and Dan McLaughlin of the craft soda-syrup company Portland Soda Works, plus three other seltzer lovers. After carbonating according to each machine's instructions for the maximum fizz level, we gave each tester 4 ounces of soda water in a smooth-walled drinking glass, and asked the testers to rank each soda maker's water on a number of factors. The SodaStream Source makes the best range of bubbly water, and it produces water that's just as fizzy as that of higher-end soda makers. Our taste testers said that the Source's water was just as fizzy and delightful as the pricier SodaStream Power's. And thanks to this machine's straightforward design, the Source is also one of the simplest soda makers to use, clean, and refill, so you can keep carbonating with ease. In our tests, the Source produced very fizzy water with medium-size bubbles that were larger than those in the SodaStream Fizzi's or iDrink Drinkmate's result. 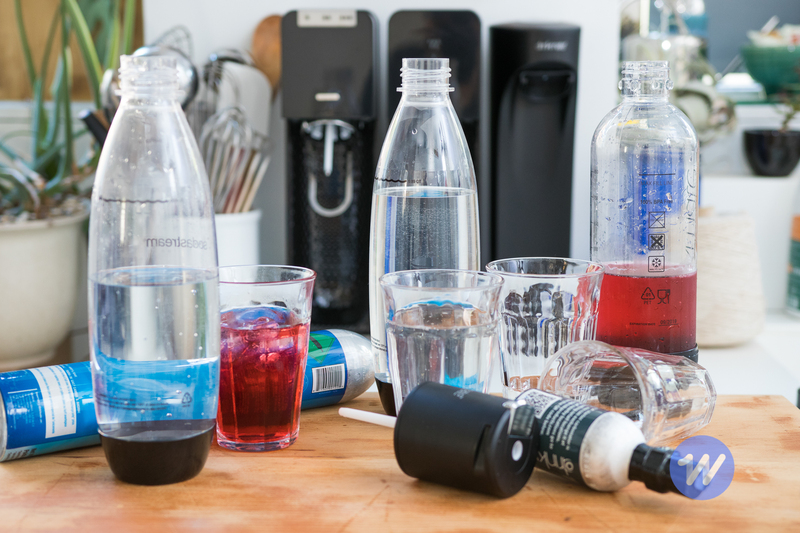 The Source's water had a rounded, zippy mouthfeel that our testers ranked as second best after the nearly identically fizzy water from the more-expensive SodaStream Power. We also liked that the Source gives you more control over the fizz level than other machines. You simply press and hold a large button for about 10 seconds, or until an LED light turns on indicating your desired level of carbonation is reached. If you can't find the Source, we also like the SodaStream Power. Its carbonator and refill systems are the same as the Source's, and it also offers three levels of carbonation to choose from. With the Power, you just press a button once to carbonate, a more convenient method than holding down a button on the Source. The Power also has a sleeker look, sporting brushed-steel accents on the back of the machine, the buttons, and the bottle. But the Power requires an outlet to carbonate water, which means you'll be more limited in where you can place it. In our tests, the Power fizzed water to equal bubbliness as the Source, but at this writing it costs around $50 more. If you want to carbonate beverages such as juice, wine, or cocktails, we recommend the iDrink Drinkmate. Although in our tests the Drinkmate produced only slightly fizzy water that wasn't as bubbly as the Source's or Power's, it did live up to its unique claim to carbonate beverages other than water. We also like that the machine comes with two bottle sizes, which can be handy if you're making components of a cocktail, for example. 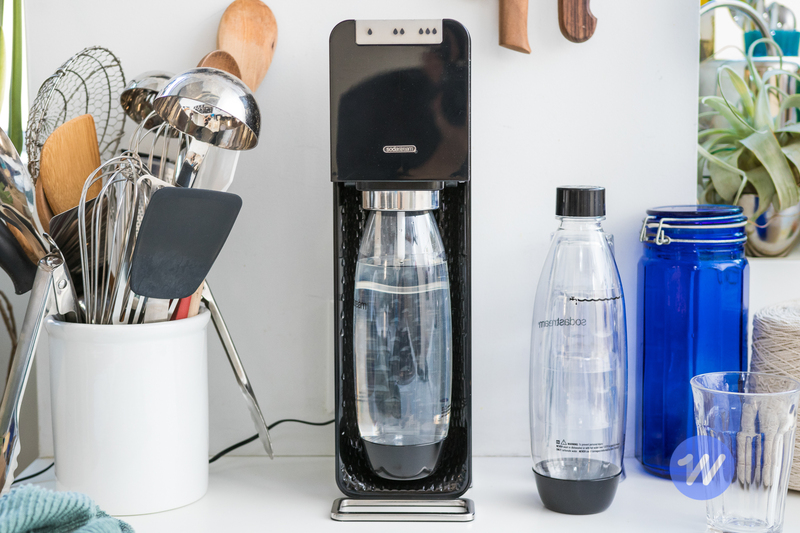 Plus, the Drinkmate is compatible with SodaStream's carbonator cylinders, so you can easily find refills. Compared with all of the soda makers we tried, the Drinkmate was more difficult for us to use, and it didn't produce especially fizzy water. But the Drinkmate stood out for its ability to directly carbonate drinks such as juice and wine. 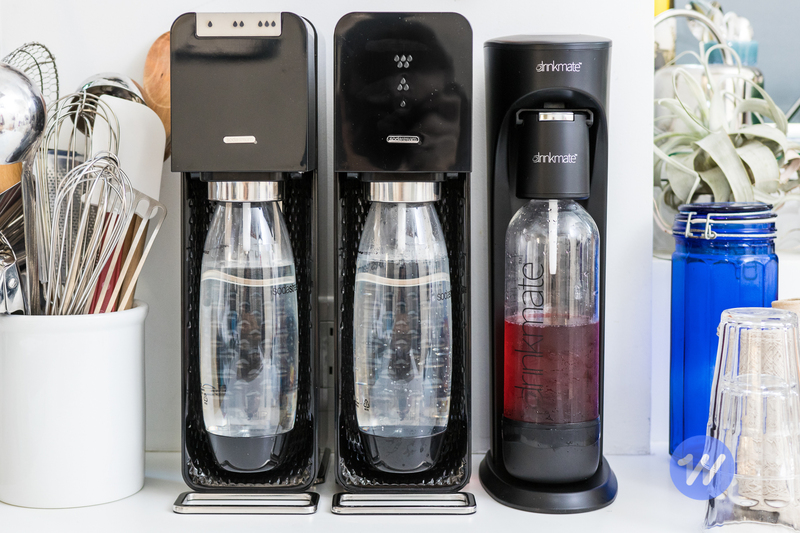 When we carbonated apple juice in this soda maker and compared it with bottled sparkling apple juice from the same brand, testers unanimously loved the Drinkmate's juice because of its lush, bubbly carbonation and zippy mouthfeel. We also tried rosé and a mocktail in the Drinkmate, and it successfully carbonated both.